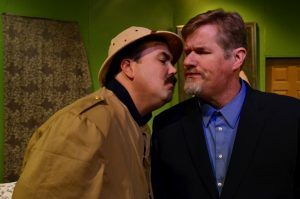 Valley Performing Arts of Wasilla has some skeletons in the closet and they’re not afraid of hauling them out and putting them on the stage as they present the ghoulish comedy Arsenic and Old Lace by Joseph Kesselring. VPA favorite Todd Broste who plays the “evil” Jonathan Brewster and director Stephen O’Brien drop by Stage Talk this week to chat about murderous spinster aunts, an uncle who thinks he’s Teddy Roosevelt and a terrified nephew who wants more than anything to just marry his sweetheart and live a normal life amid all the chaos. Arsenic and Old Lace performs October 20-November 5th. ORIGINAL BROADCAST: Friday, October 20 at 2:45 p.m.